Dr. Kaufman is the lead author of the chapter on "Poetry Therapy" in the John Wiley 2013 published text, Integrating Expressive Arts and Play Therapy: A Guidebook for Mental Health Practitioners and Educators. The book is available at Amazon and Barnes and Noble online and in book stores. "The Use of Music Therapy as a Complement to Poetry Therapy," by Dr. Kaufman and Music Therapy Professor Karen Goodman was presented at the Making Sense of Health, Illness and Disease Conference held at Oxford University and sponsored by Inter-Disciplinary.Net. The paper describes a series of workshops with a group of women in residential substance abuse recovery that utilized Dr. Kaufman's poetry book, Cracking Up and Back Again: Transformation through Poetry combined with the writing of poems and songs. To learn more about Music Therapy please click on the button below. Dr. Kaufman is available for presentations on arts and healing with a special focus on trauma. She will work to customize the presentation to address your audience's special needs. 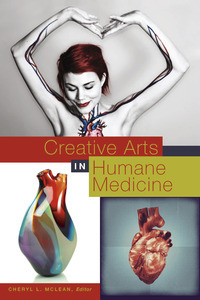 Dr. Kaufman is the lead author of the chapter, "Expressive Arts and Practitioner Self Care: Simply Being Human" in the Brush Education Inc. 2014 published text, Creative Arts in Humane Medicine. The chapter is based upon a research study funded by the Arnold P. Gold Foundation with Dr. Kaufman as the principal investigator. The book is available online and at book stores.